Lake Shore/Windermere in Toronto - Uses a LEAD-LAG fully protected left sequencing, WB Lake Shore to SB Windermere gets the leading left and EB Lake Shore to NB Windermere gets the lagging left. These are all fully protected lefts, is there anywhere in Ontario where a protected-permissive extended green occurs in Ontario? I'm sure I've seen one somewhere but I can't remember where. Does Ontario use the flashing yellow arrow yet? Such would allow a lag left in one direction without the "left trap" in the other. Are we talking about left turns with permissive phases, or any left turn (protected and/or permissive)? Other than at T-intersections, they might also be found at intersections where one of the roads is one-way (thus there isn't any opposing left turn, and the arrow and can either lead or lag). 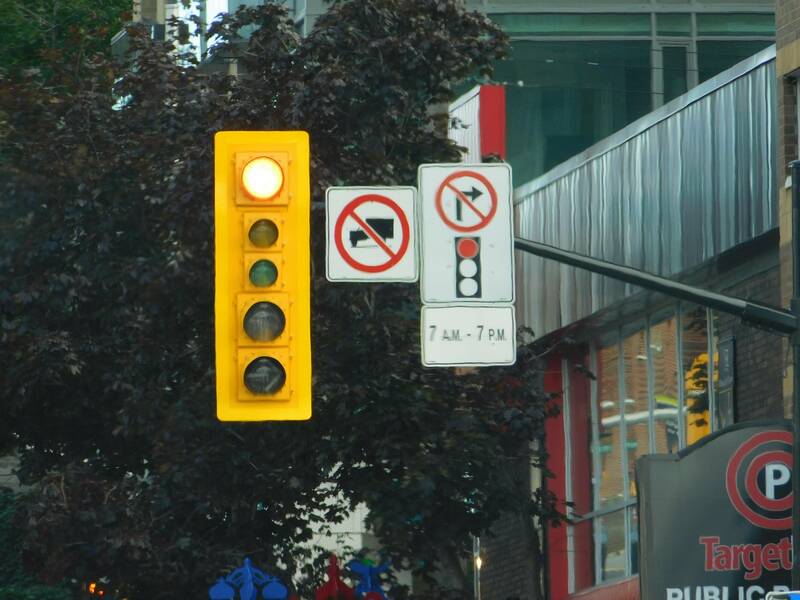 To my knowledge, Ontario doesn't use any flashing yellow arrows. Fully permissive lefts are much more common in Ontario than they are in other US jurisdictions, which somewhat negates the need for their use here. I know that FHWA provides updates to TAC on various changes to the USMUTCD from time to time at various TAC conferences, and that at past conferences FHWA has provided positive feedback about the FYA, however as far as I am ware, it's approval is still just interim, and it has not been formerly adopted in the TAC manual. That is not nearly as common in Ontario, however many of the traffic signals along Hwy 6 along the western side of Guelph have similar lead/lag protected phases. 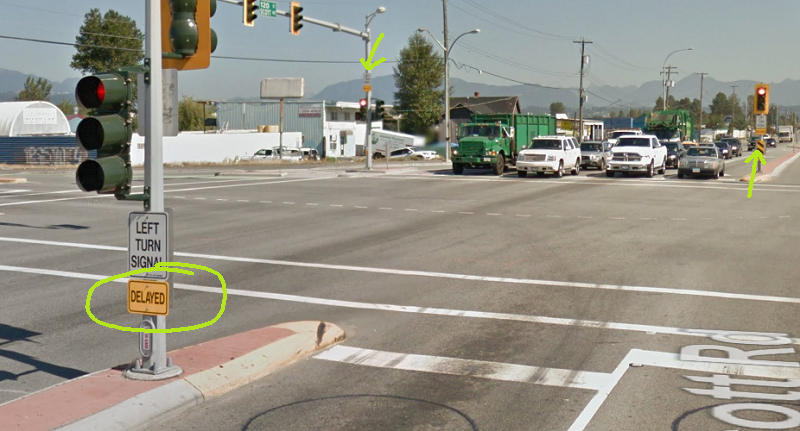 In its case, the intersections weren't wide enough to permit traffic to turn simultaneously in both directions. The intersections in Guelph aren't similarly signed with 'Delayed' tabs however.